Orbcomm Inc., owner of a data communications satellite launched by SpaceX on Sunday, is evaluating whether it can recover the spacecraft after it was deployed in a lower-than-planned orbit by a Falcon 9 rocket. A second-generation Orbcomm satellite during ground testing. Credit: Sierra Nevada Corp. The 363-pound Orbcomm satellite, built by Sierra Nevada Corp., is designed to provide two-way data communications services for customers in the heavy equipment, transportation, maritime, agriculture, oil and gas, energy, and government sectors. The Falcon 9 suffered a failure in one of its nine first stage engines 79 seconds after liftoff from Cape Canaveral, Fla., but the 15-story launcher continued into orbit and released its primary payload - the commercial Dragon resupply craft - on a good trajectory to reach the International Space Station. The rocket's first and second stages fired longer than programmed to compensate for the lost engine, but the extra burn time left the rocket with insufficient propellant to safely place the Orbcomm satellite into a higher orbit. The second stage's Merlin engine was supposed to reignite briefly to place the Orbcomm payload in an orbit between 350 kilometers and 750 kilometers above Earth, or about 217 miles by 466 miles. Because of strict safety constraints instituted to ensure satellites and space debris do not come too close to the space station, the Falcon 9 upper stage's second burn was aborted. "For this reason, the OG2 prototype satellite was deployed into an orbit that was lower than intended," Orbcomm said in a statement issued Monday. "Orbcomm and Sierra Nevada Corporation engineers have been in contact with the satellite and are working to determine if and the extent to which the orbit can be raised to an operational orbit using the satellite's on-board propulsion system." According to Jonathan McDowell, an astrophysicist at the Harvard-Smithsonian Center for Astrophysics and an expert who tracks space activities, the Orbcomm satellite was likely placed in an orbit between 125 miles and 200 miles in altitude. The OG2 prototype satellite carried propellant to circularize its orbit 466 miles above Earth, where engineers would test its performance before launching Orbcomm's second-generation constellation of 18 satellites. "It's possible but unlikely that the satellite has enough spare propellant to complete its mission," McDowell wrote in an email to Spaceflight Now. 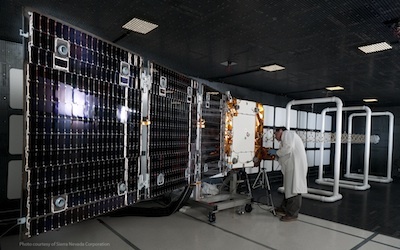 Eight more second-generation, or OG2, satellites are due to launch on a dedicated Falcon 9 rocket in mid-2013. The rest of the 18-satellite fleet will be launched on another Falcon 9 rocket in 2014, according to Orbcomm. The next-generation constellation is part of a $200 million expansion program to offer faster service through the Orbcomm system. The 18 satellites were constructed under a contract with Sierra Nevada valued at $117 million in 2008 dollars.